Fireworks light up the sky at the Summer Bash at Wings Field, July 4. Patriotic music such as the Air Force Song and the Star Spangled Banner accompanied the 20-minute show. This year’s Summer Bash, hosted by the 412th Force Support Squadron, drew thousands of active duty and civilian personnel and their families to celebrate Independence Day at Wings Field at Edwards Air Force Base, Calif., July 4. 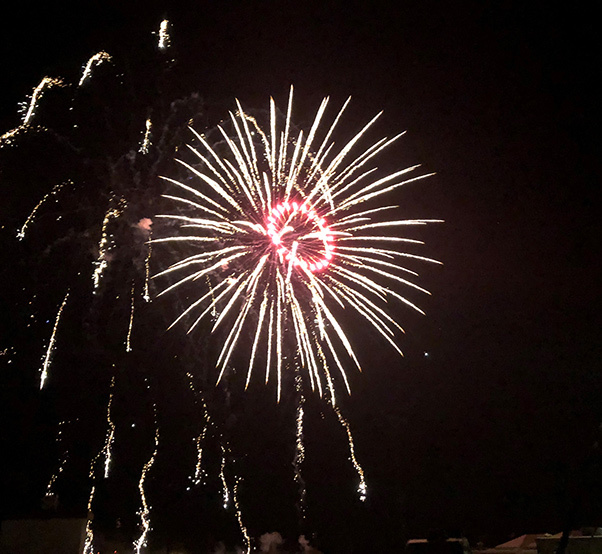 The annual festivities brought more than 2,500 people and featured carnival rides, 18-food and informational booths, an exotic car show, various contests, two country music bands and a fireworks show. The 412th Test Wing vice commander, Col. Kirk Reagan, kicked off the main activities by thanking the organizers and emphasizing the hometown, tight-knit community that is Edwards Air Force Base. 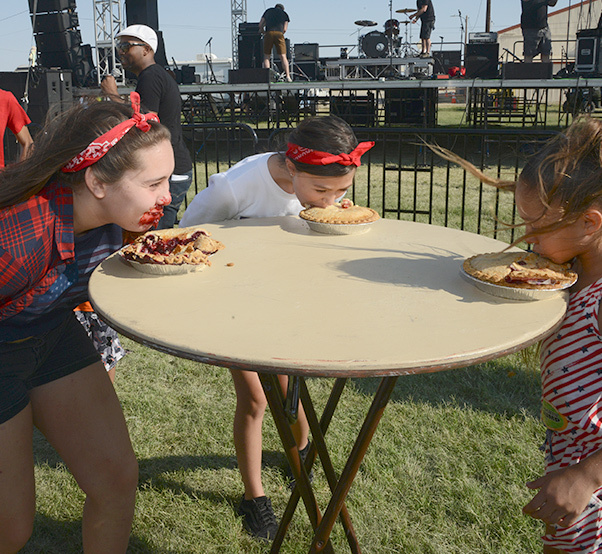 Following the official kick off, adventure seekers of all ages tried their luck at the pie eating contest, hula hoop contest and a roaring game of Simon Says. Parmalee, known for their 2013 hit, “Carolina,” plays their country hits for the large crowd gathered for the Summer Bash at Wings Field, July 4. The band closed out the festivities right before the 20-minute fireworks display which featured patriotic tunes such as the Air Force Song and the Star Spangled Banner. 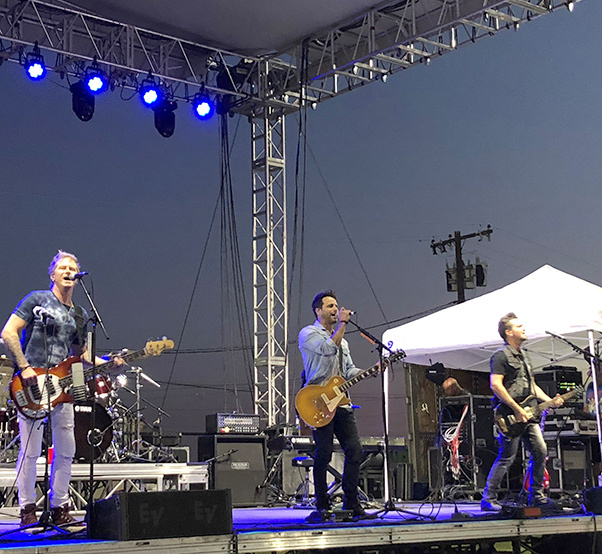 After the activities concluded, the night’s entertainment started with Temecula Road–a trio band hailing from Temecula Calif.–and headliner, Parmalee, known for their 2013 hit, Carolina. 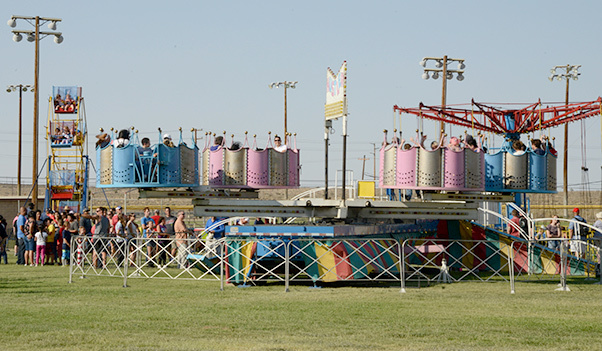 Organized by the 412th Force Support Squadron, this year brought two new rides–the Hustler, a spinning wheel thrill ride and motorized swings for younger children. 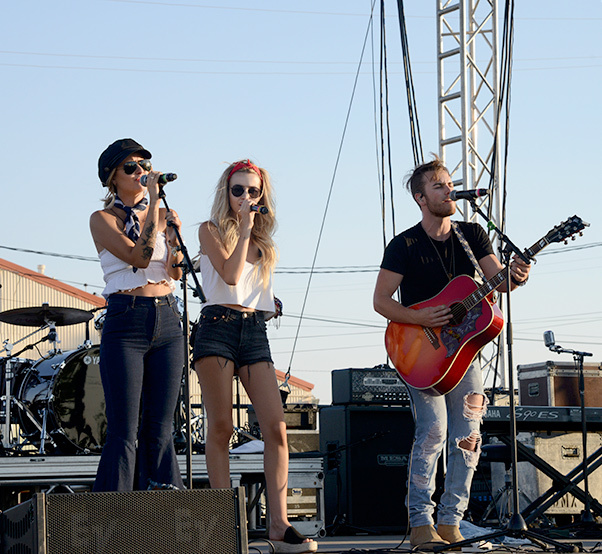 Temecula Road, a local up and coming trio opens for headliner band Parmalee at the Summer Bash at Wings Field, July 4. The country band from Temecula, Calif. played a mix of original music and cover songs for the crowd. According to Damion Jones, Community Services Flight Chief, Morale Welfare and Recreation funds were spent putting the event on for the Edwards AFB Community. The funds, all generated by customers on base through various sales, essentially go back into the community to support events like this which often take more than 600 man hours to plan and execute. 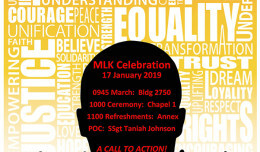 “No matter how many countless hours were tied into this event, at the end of the day, all that matters to Team FSS is serving those that serve us,” said Jones. The planning for the bash starts several months in advance, and organizers try and expand on the event year after year by adding more rides and entertainment. A parachute team was slated for this year’s show but was canceled due to prevailing winds. “We look forward to making Summer Bash 2019 an even bigger and better event for our Edwards Air Force Base Community, “said Fagan. Pie eating contestants eat their way to the end of a pie for a prize at the Summer Bash at Wings Field, July 4. Each pie had a prize such as a gift card at the bottom of the pie tin. The new carnival ride, the Hustler, thrills carnival goers during the Summer Bash at Wings Field, July 4. This year’s bash drew more than 2,500 people for the five-hour event. 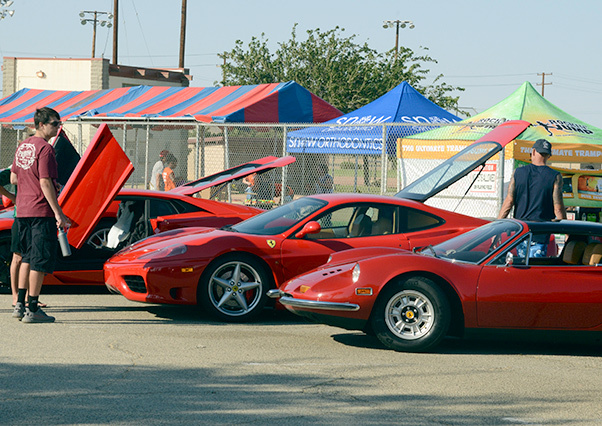 Exotic cars such as Porsche and Ferrari line the parking lot in front of Wings Field during the Summer Bash, July 4. More than 2,500 people came through the bash to see the striking vehicles. 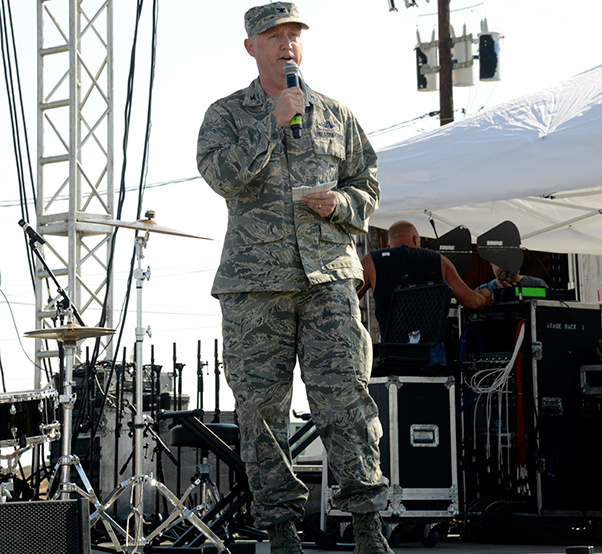 The 412th Test Wing vice commander, Col. Kirk Reagan, speaks to the crowd during the open ceremony at Wings Field, July4. During his remarks at the Summer Bash, Reagan remarked about the “great family environment” that exists at Edwards and that his family is proud to be back after several years away.